With its references to the more exotic South of France, Hotel Riviera makes the most of its prime position on the seafront at guest in search of calmness and serenity. 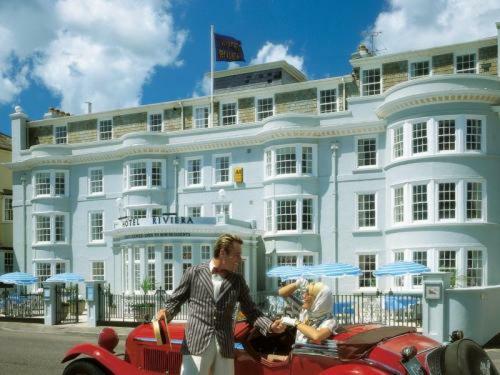 The town's handsome Victorian architecture abounds in this popular seaside resort on the English Channel in Devon. Sidmouth lies at the mouth of the River Sid in a gorgeous, sweeping valley between Peak Hill and Salcombe Hill. The town is surrounded on all sides by the East Devon Area of Outstanding Natural Beauty. The red-coloured rock that surrounds you is also a permanent reminder than you are on the Jurassic Coast. Inside the hotel you have a compelling blend of old-fashioned service and present-day comforts. Many of the classically furnished guest rooms feature spectacular sea views. The 26 bedrooms are equipped with a digital TV, tea and coffee making facilities, and an Internet access point. The en suite bathroom boasts both a bath and a shower, along with bathrobes, a hairdryer, and complimentary toiletries. Whether you stay on holiday or on business you will be treated to the kind of friendly personal attention that can only be found in a privately-owned hotel of this quality. Guests at Hotel Riviera will enjoy AA rosette-awarded cuisine in the air-conditioned dining room, with bay views. The hotel restaurant uses fresh local produce, with an emphasis on seafood. There is also a stylish cocktail bar.